I may have mentioned before that household chores are not my thing. I wish I was one of those people who cleaned when stressed, but I don’t. I’m more likely to eat. Which results in more stuff to clean. And I consider shopping to be a household chore. Something I have to do because I like to eat. Which works as incentive for groceries, but not so much for clothes. I figure if God really wanted people to buy clothes in malls He wouldn’t have allowed the catalog to be invented! So if I really, really need a new clothing item, I find it in one of the plethora of catalogs that arrive in my mailbox weekly (clearly my name has been circulated throughout the catalog industry). If the ordered item fits and flatters, I order three more in different colors. If it doesn’t, it gets repackaged to be sent back and left sitting and forgotten on some table until the day after the required “return by for full credit” date. One rushed day I was hunting for something to wear to a meeting. While washing clothes is one of the chores I do regularly without whining (now that I don’t have to wash them on rocks in a stream anymore), I’m not as diligent about folding promptly. So on this fine day, all acceptable clothing were too wrinkled. And there wasn’t time to break open the clothes steamer from it’s original packaging (received for Christmas four months earlier because I’d let my husband know it was my heart’s desire) and learn how to use it. Desperate, I pawed through my husband’s side of the closet in case something he owned could morph into a passable outfit. It did not happen. In a panic-driven burst of creativity, I remembered The Iron. Whether it was because as young child I distractedly ironed right up my arm instead of the shirt in front of me, the trauma of being required to do household chores at such a tender age, or the fact that I was better at ironing permanent wrinkles in than smoothing them out, I don’t know – what I do know is that I hate to iron. I found The Iron buried in a laundry basket full of rumpled cotton and linen in the guest-room closet. It was right where my mother had left it after doing all my ironing on her last visit – three years prior. (Save your mother-abuse comments – believe it or not, my mother likes to iron.) I had added to its pile over the years, but not reduced it any. I felt like I had discovered a new tropical island that was close enough to drive to on weekends! Clothes! 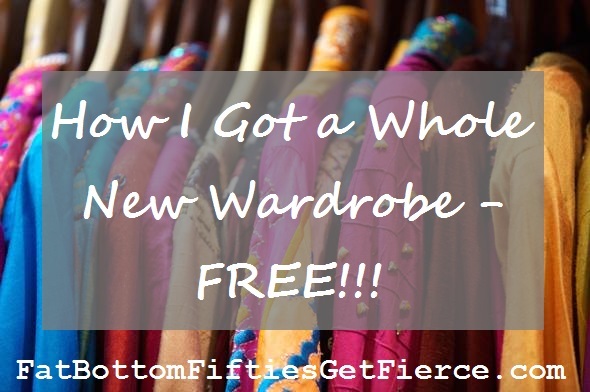 A whole wardrobe of beautiful clothes! In colors and styles I knew looked good on me! And that fit well! I picked an old favorite I had forgotten I owned, opened up the ironing board in spite of it’s unused metal legs’ screeching protest, and rediscovered the water hole on The Iron. Seven minutes later, basking in the heady light of having successfully smoothed out more wrinkles than I created, I was ready to go. But I looked forward to getting back home, eager to reacquaint myself with the discovered treasure. I can’t promise I’ll keep up the relationship with the still-hated iron, but the clothes steamer is definitely coming out of its box. And I’m even going to read the instructions. Well . . . truthfully? That’s Plan B. Plan A is seeing if I can guilt my mother into coming back very soon – we’re way overdue for a visit!